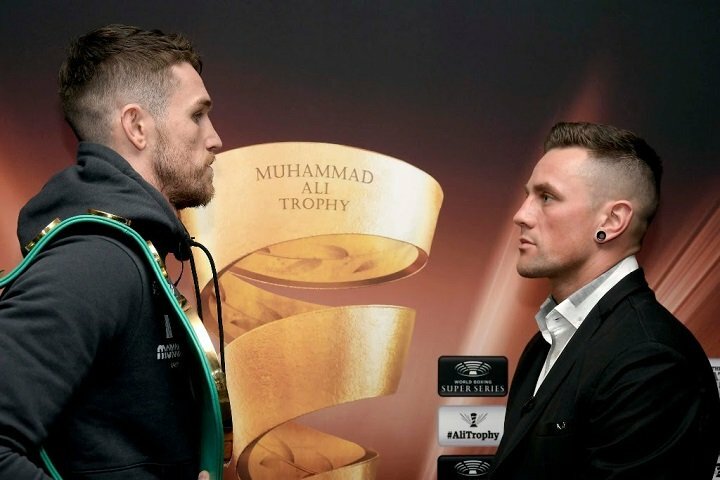 WBC Diamond Champion Callum Smith (23-0, 17 KOs) and Nieky Holzken (13-0, 10 KOs) exchanged words of confidence and went head to head at the press conference before their Ali Trophy Semi-Final on Saturday in Nuremberg. Asked if it is motivating for him to have George Groves watching Saturday’s fight from ringside, Smith responded. Substitute fighter Nieky Holzken, the undefeated Dutch super middleweight, and former world kickboxing champion joined the quest for the Ali Trophy at the semi-final stage following the withdrawal of veteran German fighter Juergen Braehmer with illness. The 34-year-old has been bold in the build-up stating he is entering the tournament ‘to take over’, and he continued on the positive path at the press conference. Tickets for the Ali Trophy semi-final Smith-Holzken at the Arena Nürnberger Versicherung are available at eventim.de.